Folks, I’m sorry it’s been so long: over a week, which is like seven weeks in blog years. In addition to a long weekend of performances and some recipe testing snafus, I kept having annoying low-blood-sugar episodes, and I haven’t been doing the food blogging thing long enough to have a post backlog/buffer. So I was barely cooking, much less writing. But one thing kept me going: hummus. Which is interesting, because I know there was a time when I didn’t know from hummus. Now, though, I have trouble imagining that time: hummus has become a common American food across ethnic backgrounds, and I’m no exception: it’s a staple in my house. It’s protein-rich, so it keeps my body happy. The good dose of olive oil gives it a fatty silkiness that’s intensely satisfying without making you feel overfull. And most importantly, it’s full of simple, rich flavors that are absolutely delicious. Based on this video, I think Remy would be a little disappointed in me. First of all, if she has to end up with somebody, Katniss obviously belongs with Gale — Peeta’s a wet blanket. Second, I’m prone to eating hummus with tortilla chips, or bagels, or any other bread-like conveyance I find lying around. But he and I see 100% eye to eye on tahini. Tahini is a paste made from ground sesame seeds, and though I’m sure you can make a delicious legume paste without it… it ain’t hummus. The flavor is vaguely similar to peanut butter or any other nut butter, though uniquely itself, and it contributes a depth of flavor to the hummus while also gives it thickness and body. 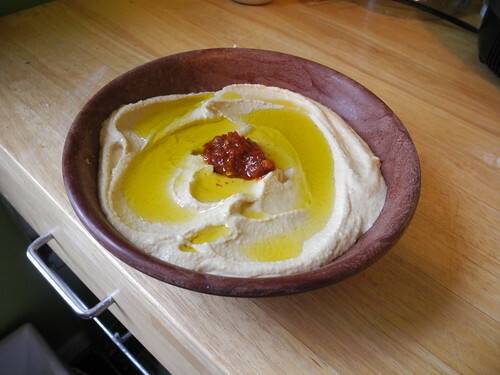 But herein lies the problem, and the reason this post is labeled ‘compromise hummus’. I really like tahini, but my husband… well, it’s not that he dislikes it. He likes the flavor well enough. But the more tahini you add to hummus, the thicker it becomes. And because I love tahini so much, I’m willing to let it get fairly thick, while he’d prefer a nice, soft, smooth hummus. This causes a surprising amount of conflict in our kitchen! And so for a few years now I’ve been searching after the happy medium, to save my palate and my marriage: hummus that has a nice solid tahini backbone while also maintaining a silken, soft texture. And have I ever run the gamut. Recipes with almost a half-cup of oil, recipes with almost none. Recipes that I adjust so much on the fly that they no longer even resemble their origins. 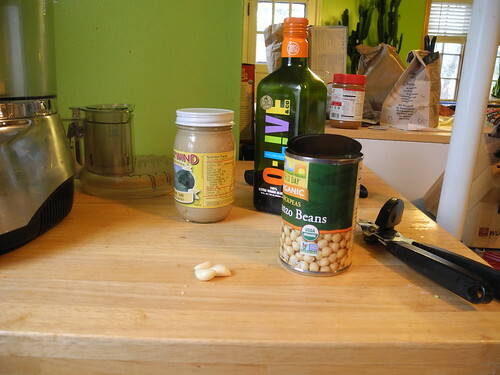 Recipes that involve peeling each individual chickpea. Recipes that involve so many other pureed vegetables that I have to keep looking over my shoulder for the hummus police. 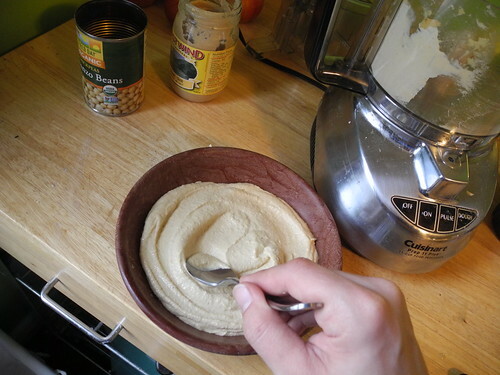 But I think I’ve finally made it to my compromise hummus: soft enough to be luxurious, while thick enough to scoop. Not too nutty, but enough. A hefty dose of garlic and spices, which we can both agree on. And it involves only basic pantry staples in easy-to-remember amounts so I can throw it together in a moment. It might not be the hummus of my dreams, or his, but it’s a hummus that we can both be happy to share. 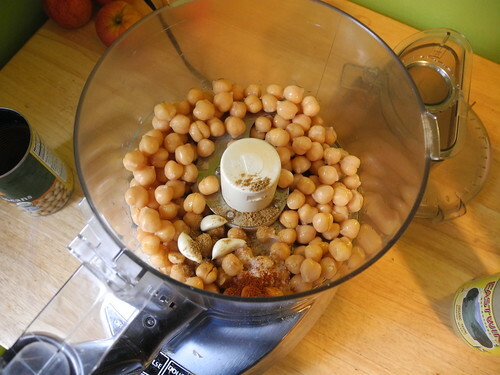 Put the chickpeas, garlic, cumin, cayenne, and salt in the bowl of a food processor. Combine the lemon juice and water, and combine the olive oil and tahini. 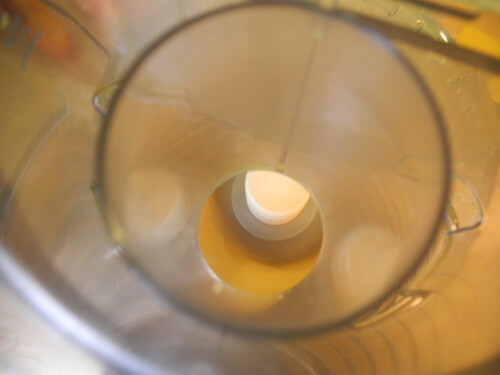 Process the chickpea mixture until well-ground, about 15 seconds. Scrape down the sides of the bowl, then with the motor running, slowly pour in the lemon-water. Once all the lemon-water has been added, process for a full minute. Scrape down the bowl if necessary, then with the motor running slowly pour in the tahini-oil mixture. Continue processing for 15 seconds once the tahini mixture has been added, then taste for salt and adjust if necessary. Keep chilled until ready to serve (the hummus will thicken slightly). If you wish, drizzle with olive oil before serving and/or add a dollop of chili-garlic paste to the middle of the bowl. You can certainly reduce or omit the cayenne. We love spicy food, so we like the hit of the cayenne (plus additional chile flavor from the chili-garlic paste) but it’s hardly necessary. You can certainly make this with freshly cooked chickpeas. You’ll want about 2 cups cooked. We use the same ingredients (except water, I’ve never used that!) in what seems like similar amounts, although honestly I never measure any of it…my question is about adding the liquid separately in stages–what does that do, is that a texture thing?